shinto: Jyosaku ranking: Ryo wazamono cuttign test rankig: Echizen province. Jyo saku and regular saku. Habaki : Gloss foiled single habaki. Blade length : 63.8 cm or 25.11 inches. Width at the hamachi : 3.0 cm or 1.18 inches. Kasane : 0.65 cm or 0.26 inches. 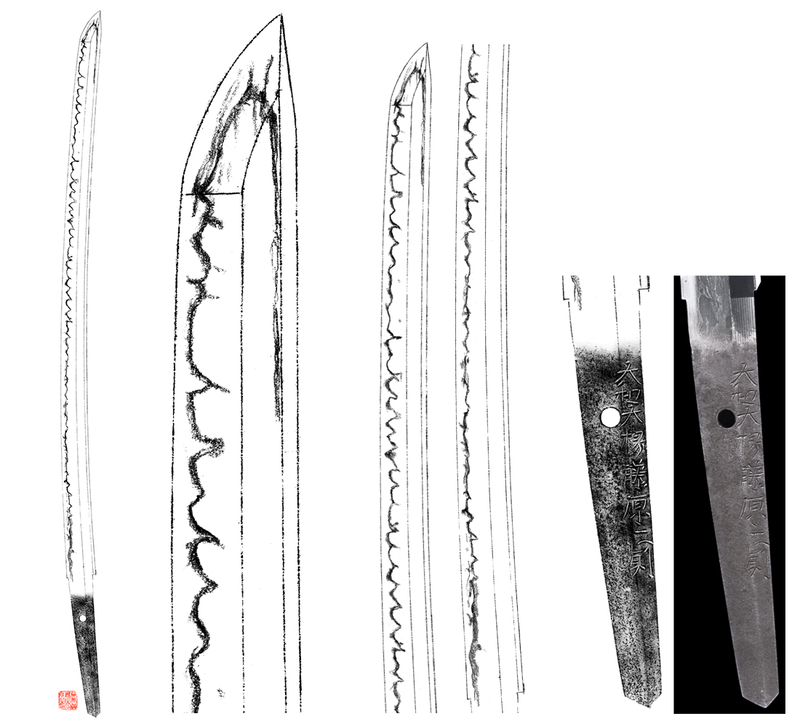 Shape : The blade is rather wide and thick with suitable sori nice looking shape. Jitetsu : Itame hada well grained with jinie attach and visible to see the texture. Hamon : Niedeki suguha from the Hamachi area and then gunome midair round shape tips up and down which is typical one of Masanori's hamon. Special feature : Yamato Daijyo Fujiwara Masanori was working at Echizen province. He was a scion of an old family of the Yamashiro Sanjyo Yoshinori and moved to Echizen Fukui province. 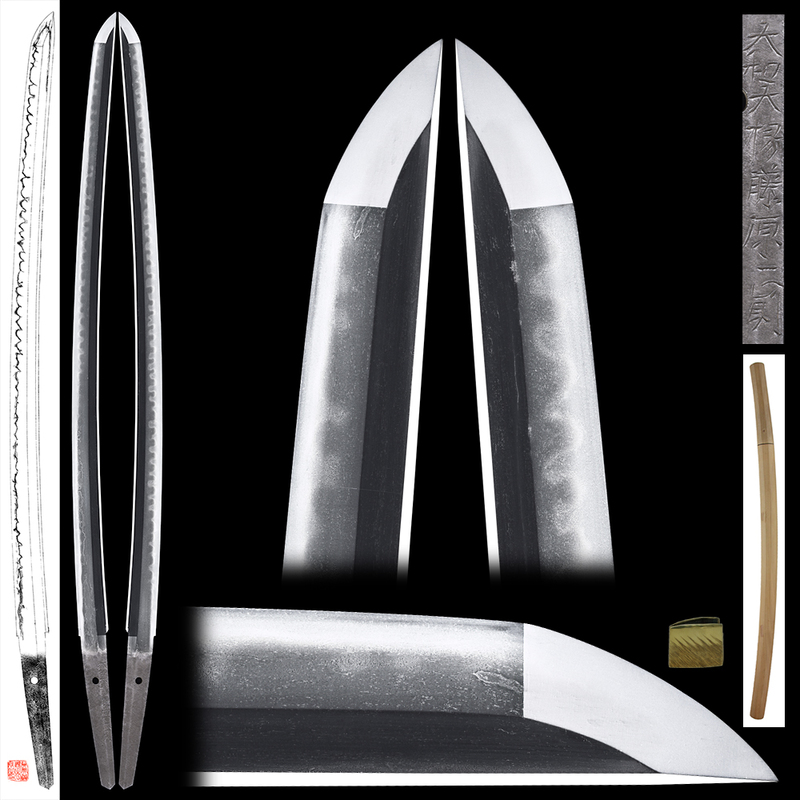 This piece hamon is typical Masanori work and has round gunome midare. and some design engraved open work. Fuchikashira : On the syakudo plate, autumn flowers and insects are engraved with gold color. Mino Goto school. Saya : Bright kinnashiji . Menuki : On the syakudo nanako plate some design is engraved with gold color. Historical background : Keicyo 19th to 20th, Oosaka Natsu no Jin battle occurred. Tokugawa shogun destroyed Toyotomi Muneie.